Are you ready for all that cinema has to offer this summer? It's certainly going to be busy! 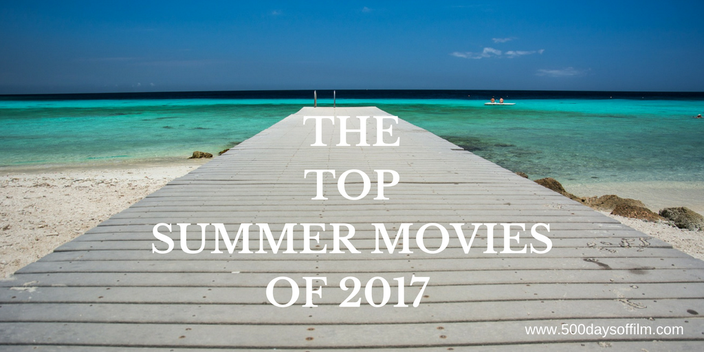 Summer 2017 looks set to entertain us with thrilling blockbusters and intrigue us with a raft of top quality independent movies. This article features the films that I am most looking forward to watching during the months of June-August (based on UK release dates). So, without further ado, let’s get our diaries together and prepare for the movies that we just cannot miss this summer. Summer kicks off with Warner Bros’ much anticipated Wonder Woman, starring Gal Gadot. Of course, we have been burnt by DC adaptations before. However, two things make me more hopeful about this film. For a start, a female led superhero movie is way, way past due. In addition, director Patty Jenkins is at the helm. Fingers crossed. Meanwhile, I am looking forward to My Life As A Courgette. This animated film has generated lots of buzz over recent months and was nominated for an Oscar at this year’s Academy Awards. However, despite its PG rating, this tale of a young boy sent to a foster home after the death of his mother may prove unsuitable for young viewers. Perhaps take them to see Despicable Me 3 this month instead. The trailer (above) for Roger Michell’s adaptation of Daphne du Maurier’s novel, My Cousin Rachel, looks pretty intense and intriguing. A remake of the 1954 film starring Olivia De Havilland and Richard Burton, Michell's film also features an impressive cast - including Rachel Weisz and Sam Claflin. If this tale proves too dark and twisty, Joel Hopkin's Hampstead could be a much needed romantic palate cleanser. I do have some concerns about this romcom but I always enjoy watching Brendan Gleeson and Diane Keaton. Meanwhile, action fantasy, The Mummy, is released on 9th June. To be honest, I don’t have massive hopes for this film. On the one hand, runny jumpy Tom Cruise movies can be rather entertaining. On the other, Universal’s hope that this will be the first in a new ‘Monster’ cinematic universe fills me with dread. June also sees the release of Colin Trevorrow’s The Book Of Henry and Edgar Wright’s Baby Driver. Trevorrow’s film, starring Naomi Watts, Jaeden Lieberher (Midnight Special) and Jacob Tremblay (Room), tells the story of a single mother and her gifted son, Henry, who writes a book about his plan to save the girl next door. Meanwhile, after the release of its trailer (see above), I am really looking forward to Baby Driver. Featuring another remarkable cast (including Ansel Elgort, Kevin Spacey and Jamie Foxx), Edgar Wright’s movie looks stunning, sounds great and promises pure, high-octane entertainment. July is a month full of stonking blockbuster movies. The action begins with Tom Holland in Spiderman: Homecoming. After an impressive debut in Captain America: Civil War, what can Marvel bring to this well-worn tale? Pixar returns on 14th July with the release of Cars 3. If we can trust the trailers for this film (please, please, please), it could be another winner for this animation powerhouse. Two other films are released on 14th July that I can’t wait to watch. First, we have Sofia Coppola’s adaptation of Thomas Cullinan’s novel, The Beguiled. Coppola is such an impressive filmmaker and her film boasts a truly terrific cast (including Nicole Kidman, Kirsten Dunst, Elle Fanning and Colin Farrell). Sign me up. In addition, we have Matt Reeves’ War For The Planet Of The Apes. I love the previous two installments in this trilogy (Rise Of The Planet Of The Apes and Dawn Of The Planet Of The Apes) and have such high hopes for this film. July also sees the return of director Christopher Nolan. His epic new film, Dunkirk, tells the story of the miraculous Dunkirk evacuation in World War 2. Warner Bros has been marketing this movie for some time and the trailers look good – they look real good. Finally, I would like to draw your attention to Michael Showalter’s The Big Sick. Based on a true story, this film follows Kumail Nanjiani (who plays himself in the film) after his girlfriend contracts a mystery illness and is placed in a medically induced coma. The movie was a huge hit at Sundance, selling to Amazon for $12 million. for choice here. I can’t wait to see action thriller Atomic Blond (starring Charlize Theron), Steven Soderbergh’s Logan Lucky (starring Katherine Waterston, Channing Tatum and Sebastian Stan) and David Lowery’s A Ghost Story, which (after Ain't Them Bodies Saints) will pair Rooney Mara with Casey Affleck once again. I am also looking forward to Annabelle: The Creation - mainly because I love director David F. Sandberg's previous film, Lights Out. In what is shaping up to be a pretty spectacular month of movies, the film that I am most looking forward to watching in August is Kathryn Bigelow’s Detroit. This film, about the riots that took place in the city in 1967, reunites the Oscar-winning director with The Hurt Locker and Zero Dark Thirty writer, Mark Boal, and stars John Boyega, Anthony Mackie, Will Poulter and Jack Reynor. Detroit may not only be one of my favourite films of the summer, it may be one of my favourite films of the entire year. Meanwhile, there are a few films that may yet get a summer release date. For example, following his impressive debut film, Krisha (which I loved), director Trey Edward Shults is set to return with psychological thriller, It Comes At Night, starring Joel Edgerton. I am also really looking forward to Ana Lily Amipour’s new film, The Bad Batch (described by IMDB as “A dystopian love story in a Texas wasteland and set in a community of cannibals”), starring Keanu Reeves. If it is anything like as good as her previous film, A Girl Walks Home Alone At Night, it will be a must see summer film. I don’t know about you, but I now can’t wait for summer to start. If this list is anything to go by, I'll be spending most of my time in the cinema! What are you most looking forward to watching? Let me know in the comments section below or come find me on Twitter or Facebook!